When wandering a flea or antique market, one just never knows what treasures there are to be found. From terrific steals to relics from a past long forgotten, there is usually something to excite the fancy of just about anyone. During one of his frequent visits to the Grayslake Antiques market, The Conservation Center’s client Robert Le Clerq had one such awe-inspiring moment that brought him back into his younger days. He came upon an old, carved wooden sculpture that immediately reminded him of nuns of the order of the Sacred Heart. Though this probably would not be significant to most, Mr. Le Clerq has fond recollections of Barat College. From serving mass as an alter boy, to watching his older sister graduate, to even dating a few of the girls who attended the private Catholic school, Sacred Heart had played a significant role in Mr. Le Clerq’s younger days. His wife, Susan, who had also attended Sacred Heart, recognized the sculpture just as quickly and could even put a name to the face, as the students called her “St. 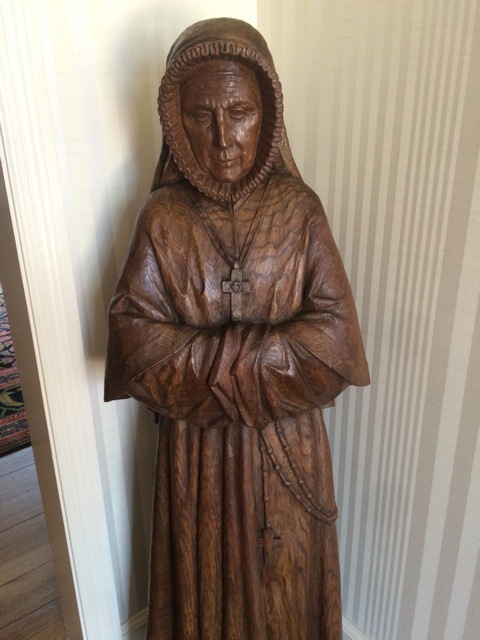 Philippine Duchesne.” After confirming with the vendor that he had in fact acquired the piece from an auction at Sheridan Road, where the institution is still located to this day, The Le Clerqs knew that despite the sculpture’s weathered condition, this piece belonged in their home. Once purchased the sculpture, it sat prominently in the couple’s front hall for some time before coming to The Center for proper conservation. Over those first few years, this beautiful hand-carved sculpture quickly became a topic of conversation in the Le Clerq’s household, inspiring Robert to conduct a bit of research into the lady's provenance. Information on Saint Rose Philippine Duschesne is quite abundant, as Pope John Paul II only recently canonized her in 1988. A French educator and nun (1769-1852), Saint Rose helped found some of the earliest congregations of the Sacred Heart in France in the early 1800s, eventually travelling to America on missionary work. Thoroughly impressed with the artistry of the carving, Mr. Le Clerq was not satisfied with just knowing her name—he had to find the original creator as well. After reaching out to numerous religious archives, the Holy Family Parish in Chicago’s South Loop responded saying they have many similar carvings that were done much earlier in the century by a local family named Buscher. Digging further, Le Clerq again found reference to this family of artists in a book titled Barat College: A Legacy, A Spirit, A Name written by Mother Martha Curry, who was also a member of the order of the Sacred Heart. The book gave mention to a Sebastian Buscher, who along with his uncle, Anthony, and cousin, Franz Anton, made significant artistic contributions to the church, mainly in the form of carved wooden sculptures of the Holy Family. With the name and a history secured, the Le Clerq’s finally decided to seek full treatment on the sculpture at The Center, which was already quickly deteriorating from age and damage accrued over the years. When the carving finally arrived at The Center, it was evident that the sculpture had somehow sustained water damage. Namely, the presence of water caused shrinkage in the wood, which resulted in numerous splits and losses that needed to be addressed. It had also significantly discolored the wax polish to the point where features of the carving were completely obscured. When The Center’s conservator attempted the treatment of the shrinkage, he discovered another major fault within the piece that required immediate attention. 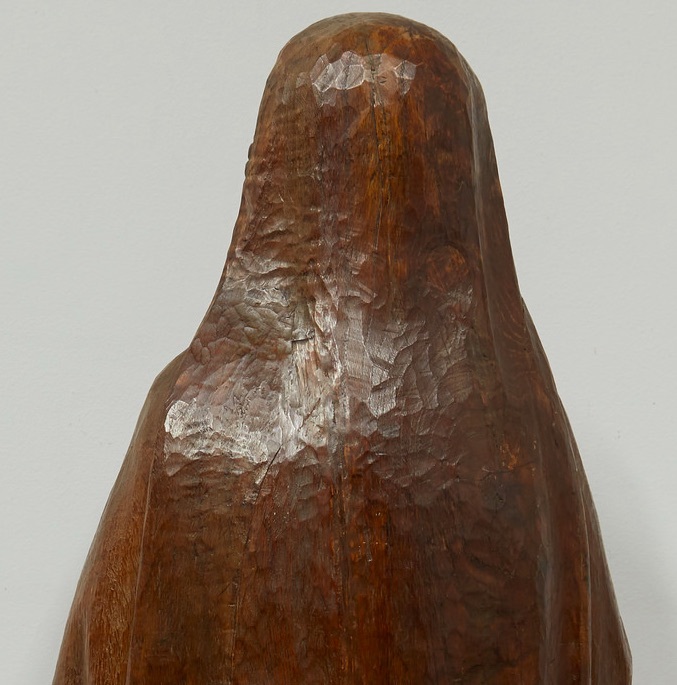 The carving, which had been made from one complete log, had a few imperfections that were modified by the original artisan with added materials. However, once the piece was in the lab, it was clear that the altered splice joint was now failing. 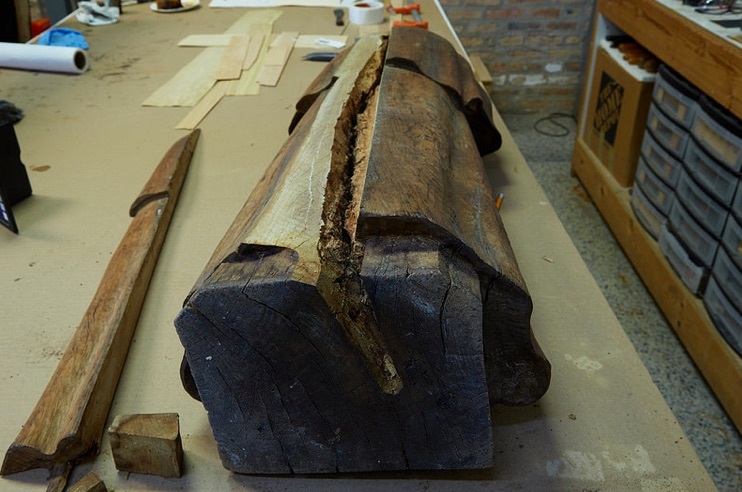 Because the failing joint was right next to areas of severe splitting from the shrinkage, our conservator decided to completely remove the large piece of wood that was filling the original gouge imperfection in the original log. This gave him access to the interior of the carving, which allowed him to successfully treat the shrinkage splits. With all areas of loss now consolidated and stabilized, The Center’s conservator was able to reshape the fills so that the old piece of wood previously removed could be slipped seamlessly back into the carving. Now, with a stable and complete whole, the issues of discoloration could be addressed and treated. First, the materials used to fill the splits had to be colored out so as to appear uniform to the original materials. Next, the yellowing polish was removed with a conservation method that involves massaging a solvent into the surface of the wood. The blooming or discoloration was then buffed and waxed to create a uniform finish with archival polishes that will not degrade like those originally applied. With all of the shrinkage and instability addressed, the carving had improved visually by scores. The Le Clercq’s decision to bring Saint Rose in to The Center for treatment now saved them from future heartbreak. If the failing splice joint had not been immediately re-adhered, the additional strains on the shrinkage splits would have caused irreversible damage. Luckily, this wood-carving, that is possibly already over a hundred years old, now stands beautifully in the Le Clercq’s household once again. "With Saint Rose fully treated, the decision to conserve this piece ensured it will be around for generations to come in my family," said Robert Le Clercq. "The sculpture will continue to elicit fond memories of the wonderful nuns at Sacred Heart, with many stories to tell."